Meyer, J. C., 514-516 W. Washington st.
McLaughlin, H. D., 53 S. Potomac. Orrick, L. J., 31 N. Potomac st.
Ramacciotti, D., (wholesale) N. W. Cor. Pub Sq. 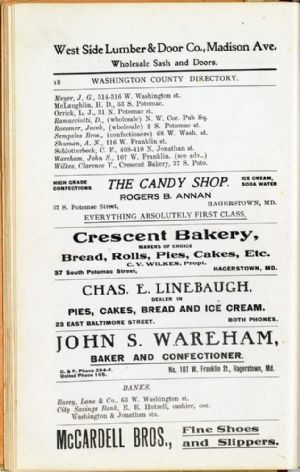 Roessner, Jacob, (wholesale) 2 S. Potomac st.
Sempeles Bros., (confectioners) 68 W. Wash. St.
Shuman, A. N. 116 W. Franklin st.
Schlotterbeck, C. F., 408-410 N. Jonathan st.
Wilkes, Clarence V., Crescent Bakery, 37 S. Poto. 37 S. Potomac Street, HAGERSTOWN, MD. Bread, Rolls, Pies, Cakes, Etc. 37 South Potomac Street, HAGERSTOWN, MD. PIES, CAKES, BREAD AND ICE CREAM. 23 EAST BALTIMORE STREET. BOTH PHONES. C&P Phone 264-F No. 101 W. Franklin St., Hagerstown, Mt). Eavey, Lane & Co., 63 W. Washington st.
City Savings Bank E. E. Hutzell, cashier, cor.